Google street view has been introduced back in 2007 and it is already part of everyday navigation. The initial hype ha settled, at least in countries were it is introduced now for more than a year like the UK. In others legal battles and other misunderstandings are still under way. 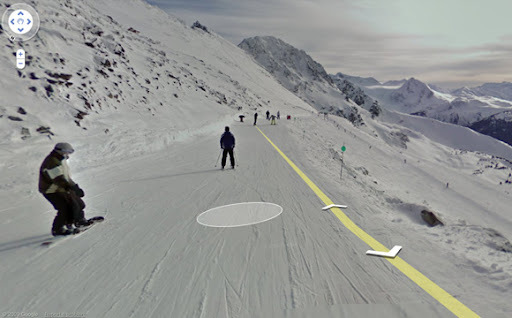 However Google is never short of news stories and with the upcoming Winter Olympics in Vancouver they have taken Street View to the slopes and enable everyone with access to the internet to see the beautiful landscape and ski slopes the athletes will be heading down next week in detail along the tracks. Picked up as reported by the Google Lat Long Blog or Gizmodo. The area covered so far is Vancouver at Whistler Mountain where the Winter Olympics 2010 start on the 12th, which is on Friday. You can test it right here. Put on your skis your already on the slope! Documentation here in the clip with details of how it was recorded. I would like to share an alternate skiing experience for the Olympics with the world. http://blog.virtualwhistler.com ‘The Virtual Whistler Olympic Blog’; created to provide visitors the ability to explore whistler virtually. Ski the Men’s Downhill Course or walk through the village remotely. Take the time to post your experiences and we will try to place your comments, photos and videos into the virtual environment for others to experience. Guest Posting and Linking to other relevant blogs welcome. Google is not the only ones doing this. Here is another virtual ski map of Whistler. This one uses video instead of still imagery, but you can still look around in 360 while the video is playing! Thanks Jason for the link, I will follow it up. Are you involved with the project?